Old Long Island: Old Long Island Turns 4! Old Long Island Turns 4! Today marks the fourth anniversary of the creation of Old Long Island. After all this time there have been 1,244 posts, over 355 estates featured, thousands more pictures uploaded, over 220,000 visitors and over 1.4 million page views. I want to thank everyone who has ever shared a picture or a comment and helped keep this place alive and moving forward after all this time. And as I've said in previous years, I hope I have enough material to keep this place going for four more years. Above, a Christmas and New Years card from 'Wheatly', the E.D. Morgan III estate designed by McKim, Mead & White between 1890-1900 in Old Westbury. Happy holidays! Photo from the Elizabeth Morgan Jay Etnier Hollins archives. Happy Anniversary---the blogosphere is the only place where I get to be younger (two last week). For us (I dare speak for 'us' on this topic), it's been fun and educational. And as always, I stand in awe of your consistency. Now, on to that Christmas card. I stand in awe of that too. Wouldn't it be fun to arrive through that arch, home for the holidays. Cheers, and a CPH Christmas to everybody. Happy anniversary, Zach! Merry Christmas and happy holidays to all! Best wishes to all in 2012. Zach, Happy Anniversary and Happy Holidays. Thank you for your dedication, energy and time to this blog. I have looked forward to it every day since stumbling onto it over a year ago. While in college - more years ago than I'm able to admit - I spent hours in the Architecture library devouring the residences in the architecture magazine archives from the gilded era. Your blogs bring that same enjoyment. I also thank DED for the depth of insight he adds each day about the houses, their occupants, the architects, and design in general. Best wishes in teh new year. "To Zach, who day after day does the impossible -- Making a great romance out of so many teardowns!" Happy Anniversary and Merry Christmas! So many incredible estates; so many hours of enjoyment. Thank you, thank you, thank you, Zach for providing this wonderful forum. Happy Holidays to all and especially to Santa Zach who brings us gifts every day of the year. Also, thanks and best wishes go out to his brigade of elves who add insight and amusement to our daily lives. (Regulars: DED, HPHS, Ancient, Magnus, DFP and relative newcomers Patricia, Annie, et al). And as the politician/AA-types are wont to say "Four more years", "One day at a time". Congratulations. As a relative newcomer to this site, I join in on the thanks to Zach. OLI is part of my daily routine and I check back during the day any time I want to procrastinate about doing real work. Which some days can be often. Thank you and best wishes to all the commenters as well. You folks make me feel as if I'm at a wonderful cocktail party where everyone is smart and interesting. The other day I was looking in the New York Times archives, hoping to find some photos of estates decorated for Christmas. I found an article from 1940 about various OLI holiday parties which mentioned that JP Morgan was caring for a "refugee child" -- an 11 year old boy named Lord Primrose. I love those kind of details and googled him to discover that Lord Primrose is still alive as the 7th Earl of Rosebery and various other titles. So here's to Zach, Lord Primrose and the rest. And, finally, as a non-architect, I have to say that you all have taught me to look at buildings differently. Thanks for everything. Happy Anniversary, Merry Christmas, and Happy New Year to all! This site is my daily crack habit! Zach - Congratulations and Thanks for many hours of enjoyment & insight. Merry Christmas to all! I join with the rest of the OLI community in congratulating you Zach, and wishing you and all of the contributors a Merry Christmas and happy New Year. 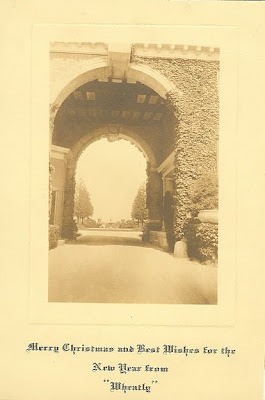 It really is a gift to visit here every day, reminisce about my time in Locust Valley, and see and learn so much about the great estates - some of which I knew well from the service entrances. If I were back home, tonight I would join in a family ritual of a Christmas Eve dinner and then the midnight candlelight service at the Reformed Church, next to that beautiful cemetery in Locust Valley. For now, a visit here brings me back a bit to LI. Thank you for the hours of enjoyment! Zach - Its been a true pleasure working with you these last four years! Mazel tov on the 4 years Zach. I really enjoy this blog and the education I am getting on the these great old estates. This is one of my most favorite sites. I too have add my wishes for a Happy New Year to you and to all my friends here. Your site is a gift I look forward to every day. Thank you. Wheatly....so fitting for the holiday season,since for me, this estate is the epitome of magic...as close as heaven on earth as one could get. Zach....thank you so much for this site, I look forward to my daily visits which bring me much joy to a rather dull life, and also appreciate the comments and insights of all the other regular posters. I wish you all a Happy Hanukkah,Magical Yule, Merry Christmas and a safe and healthy New Year. Zach, thanks again...also for Beyond the Gilded Age...I now also look forward to a visit there everyday. Happy Anniversary OLI and Zack! I enjoy coming here and reading your blog everyday. Thank you for your time and effort. Happy Holidays to the OLI Family. Four more years!!!! I hope at least that much. OLI is always informative, always amazing, always a pleasure. The site leaves me awe struck to see how much incredible architecture, artistry, craftsmanship and splendor surrounds us and yet also how much has been lost forever due to apathy, changing lifestyles, encroaching suburbia and the inevitable progress of time. OLI breathes life back into a long lost world. I look forward to OLI and BTGA each and everyday. Congrats. I don't want to envision a time when I get up and can't enjoy Old Long Island. Let's hope you never run out of material, Zach. The families whose relatives lived in these houses (and others that we haven't seen yet) must have photo albums that they have yet to share. A plea to those people- please send Zach copies of your personal photos of your families and houses. We who read this blog faithfully will appreciate your sharing. Merry Christmas to all! Happy anniversary and thanks so much for "Old Long Island" I am amazed at the wealth of material you have provided and do not miss checking it every day. I began research on Long Island estates in the late sixties and will begin to contribute information to your site. Best wishes for the new year! Happy Anniversary...as one who had the great joy of running and playing in the remains of a few grand estates...your site brings back many memories. God bless you.